"In a tiny article in the July 27, 1933 Marin Herald, you can find a brief mention of Frank Sousa, then a San Anselmo volunteer fireman who was named as a member of the publicity committee for an upcoming firemen's barbeque at the Fairfax Cascades. Forty years later almost to the date, on August 1, 1973, Frank Sousa retired as San Anselmo's third-ever fire chief to accolades as 'one of the most valuable employees the city of San Anselmo has ever had,' having served the department for 37 continuous years. Francis Sousa died last Tuesday, February 25, 1986 at the age of 74. On Friday, his family and friends came together to eulogize and share stories about the man at St. Anselm's Church, the very site where he married his wife, Mary Louise, in 1936, and later sent his three children to school. The mass was followed by a police and fire truck-escorted processional down San Anselmo Avenue, a nostalgic route which passed by Ross Avenue where a young Frank Sousa grew up, Tamalpais Avenue where he raised his own family, and the Station 19 firehouse, a building dedicated to him in 1977. Fire trucks from the county, Kentfield, Ross and the Ross Valley Fire District lined up along the Miracle Mile to pay official respects, and at the San Rafael Fire Station on C Street, a complete complement of firemen stood at attention and saluted Sousa, ringing their bells 13 times in a traditional farewell to a fellow firefighter. The San Anselmo native was born June 3, 1911 in Kentfield and grew up on Ross Avenue, where Wade Thomas School now stands. Later, the family moved down the street and Frank lived there until he married and moved to his home on Tamalpais Avenue, within calling distance of the new fire station on San Anselmo Avenue. Frank's father, Antonio, came to Marin in 1865 from the Azores when he was only 4 years old. His mother came from Portugal later, and the two met and married, bearing 13 children, of which Frank was number 11. Antonio was a contractor and built many of San Anselmo's roads. He was also a drayman and hauled goods around town in his wagon. The family leased land in the early 1900s near what is now White Hill School, where Antonio could keep all his children busy on the ranch with a little dairy farming. When Frank Sousa joined the San Anselmo Fire Department on August 11, 1936, there were only three other firefighters. When he retired in 1973, there were 19. But back when he started his career, the men in the department were affectionately called "the fire boys," and two horses carried all the fire fighting equipment. Their names were Colonel and Major, recalled Antone Sousa, Frank's only son. Antone is an admissions director at Mann Catholic High School, but said he considered becoming a firefighter at one point. "They were the good guys," he said. Back in the early days, firefighters would actually rescue cats from trees, performing what Antone called "humanitarian" duties that Frank loved so much. The old-time firefighters were a close-knit bunch, and used to hang out together when they were off-duty. His father was a "perfectionist," Antone ex- plained, demanding the best from himself and from those who worked for him. "He loved being a fireman," Antone said, "but he also loved being involved in the community." He cited as one example Frank's help in building the library at St. Anselm's School. Frank Sousa's best-loved hobby was to "putter around," particularly with woodwork, Antone said. He liked to build and repair furniture and was a "real artisan with his hands." Neighbors and friends were always bringing old radios and lawnmowers over for Frank to fix, and soon his garage was cluttered with the stuff. Ross Valley Fire Chief Bob Beedle, the town's fifth chief, preceded by Richard McLaren, Sousa, Nello Marcucci and Charlie Cartwright, worked with Frank for 17 years, and laughed as he remembered how Frank would come over to friends' homes in his uniform to fix their broken gadgets. "He was a real professional," Beedle said. "He always wore a tie to work and always looked nice. He never came to work in a bad mood - or at least he wouldn't show it. He had a Portugese temper but would start laughing in a second," Beedle remembered. "One statement made by an ex-fireman was put best," Beedle said. "If Frank had an enemy, it was the enemy's fault." Although Frank had various health problems during the last years of his life, he did some traveling with his wife before she died and continued to putter around. "His philosophy was to live a good life to the best of his ability," Antone said, "and to help people and show love and concern for his community and people in general." Frank Sousa was a past president of the San Anselmo Lion's, a member of the San Anselmo Firemen's Association, and a past president of the California Fire Chief's Association. Three of Frank's siblings survive [at that time] - William Sousa, a retired fire captain who still lives in San Anselmo; Dorothy Simon of Marinwood (a former resident of Fairfax); and Rose Kennedy of Kingman, Az. Frank had three children of his own - Sharon Carroll of Palos Verdes; Antone Sousa of San Anselmo (named after his grandfather); and Peggy Sousa, who lives in the house on Tamalpais . He also had four grandchildren - Erin Carroll, 15, Shannon Carroll, 9, Bryan Sousa, 13, and Tom Sousa, 12. The family prefers donations to Hospice of Marin." ​See the Slide Show below for more photos, with thanks to Frank's son Antone Sousa, a volunteer with the San Anselmo Historical Museum and member of the San Anselmo Historical Commission. Chief Frank Sousa pictured in 1970. 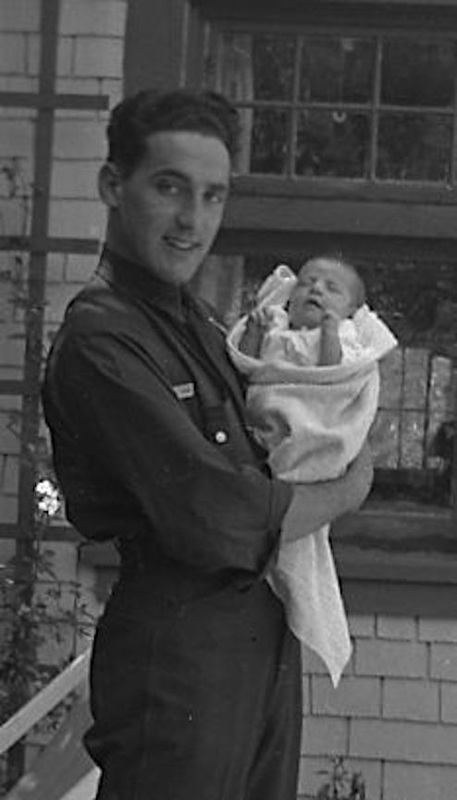 Frank Sousa with his first child. 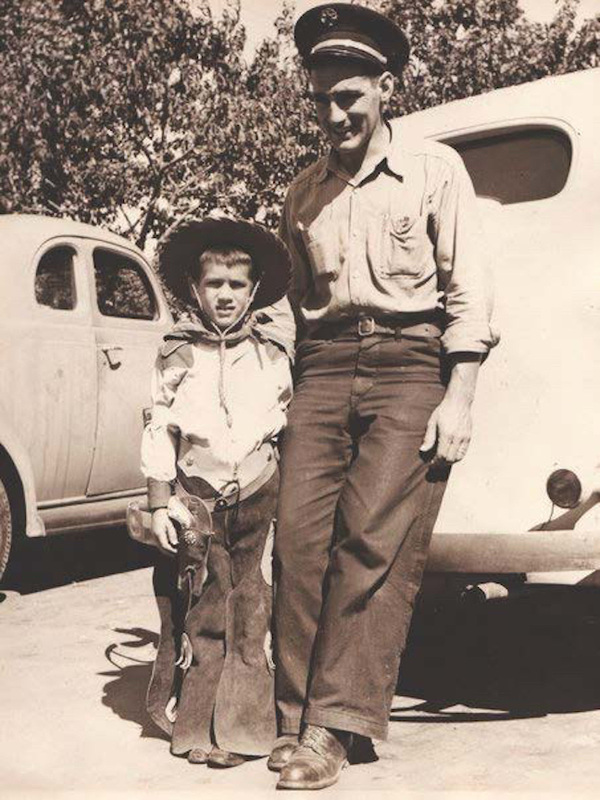 1949 - Antone Sousa pictured with his father Chief Frank Sousa behind the San Anselmo Fire House. 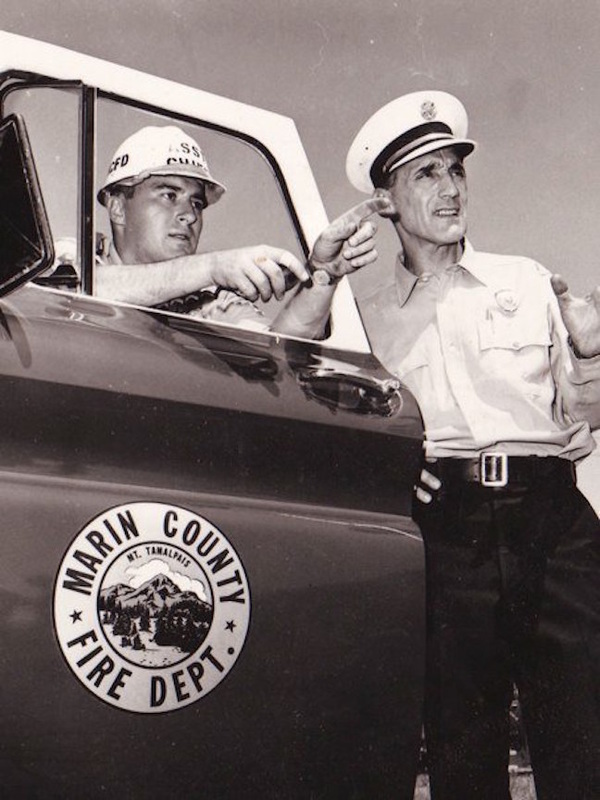 (l-r) Then Marin County Assistant Fire Chief Stan Rowan, and Chief Frank Sousa. Rowan would go on to serve as Chief of the Marin County FD, now retired. (l-r) Frank Sousa, Chief Nello Marcucci, and Chuck Daniels pictured behind a Fire Prevention Week display in front of the San Anselmo Fire Station.